WHERE WE TAKE THEM IS IMPRESSIVE. BUT NOTHING COMPARED TO WHERE THEY GO FROM HERE. Our Outpost program provides teenagers with progressive wilderness trips that range from Lake Superior and Rockies to Canada and Alaska. But the skills they hone and the confidence they gain will take them even further. Building character and instilling leadership qualities are as big a part of the journey as backpacking, sea kayaking and canoeing. And as challenges grow, so does the individual, gaining strengths and insights that will endure long after the trip is over. OUT HERE, MOTHER NATURE ISN’T JUST AN ELEMENTAL FORCE. When you’re on trail in Outpost , you are on the front lines of all the incredible beauty, wonder and challenge nature can bring your way. So Camp Manito-wish YMCA is dedicated to providing an experience that’s unforgettable, enriching and positive. Here are five major factors that set our wilderness tripping program apart from the rest. Over 80 years of experience and counting. Since the 1930s, Camp Manito-wish has been providing extended wilderness travel programs for teens. It’s this experience and expertise, coupled with time-tested-and-proven practices and a singular focus on character and leadership development, which has made Outpost one of the premier wilderness tripping experiences in the nation. Lessons that last beyond the journey. In Outpost, every environment, encounter and experience is harnessed as a tool to provide collaborative leadership skills that last long after the trip is over. We’re not just creating wilderness-only leaders; we’re instilling character and leadership qualities that will serve participants in any situation. Challenge level = comfort level. Outpost is a progressive program with four distinct levels. Trip duration grows with every year of participation, with destinations, experiences and challenges delivered in an age- and skills-appropriate way. As the program progresses, youth advance right along with the experience, gaining positive new leadership and character traits along the way. Variety. Flexibility. Quality. Pick three. All four levels of our Outpost program offer three distinctive trips, each built around canoeing, backpacking or sea kayaking disciplines, each exploring a different natural area in North America. In this way, we can provide a wilderness experience that meets each participant’s interests, skill levels and personal preferences, while delivering a consistently amazing experience. Risk Management is our highest priority. All Outpost trips begin at Camp Manito-wish YMCA for skills training and review. 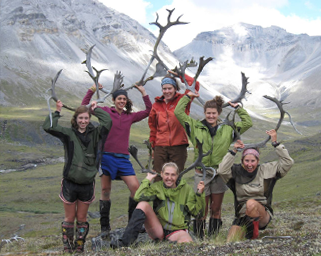 Our trip leaders offer both experience and wilderness safety training and certification . Physician-conducted physicals are required. And emergency communications equipment is mandatory on every trip. So participants are well-grounded and well-prepared going out, and well-supported during the entire Outpost adventure. YOU CAN’T BEAT THE VIEW. Life on the trail is a life without frills. You embark on a journey that’s one part spectacular, one part spiritual and one (or more) parts physically and mentally demanding. There are many challenges — and even more rewards . Like marveling at sights few will ever see. Viewing wildlife in their natural habitat. Dishing up creative new cuisine . And taking the road far-less-traveled, if it was ever traveled at all. No, the experience isn’t exactly like a five-star hotel. But the 1,000,000-star sky has a way of making up for it. Camp Manito-wish YMCA secures permits with the following: Superior National Forest, Apostle Islands National Lakeshore, Isle Royale National Park, Ottawa National Forest, Chequamegon-Nicolet National Forest, Quetico Provincial Park, Ontario Crown Land, Custer Gallatin National Forest, Shoshone National Forest, Nez Perce-Clearwater National Forest, Pukaskwa National Park, Gates of the Arctic National Park, Arctic National Wildlife Refuge, Alaska State Forest, and Tongass National Forest. THE NEXT RIDGE LOOKS A LOT LESS STEEP ON A FULL STOMACH. Whether you’re portaging through swampy terrain or paddling through whitewater rapids, the challenges of the trail — both physical and mental — are numerous and constant. So providing high-nutrition, high-energy meals is a vital part of the Outpost experience. All of our trips are carefully planned and provisioned for the unique demands of each destination, duration, activity and itinerary. For shorter Outpost excursions, all necessary supplies are carried from the start; longer tips are resupplied at prearranged checkpoints. Meals are prepared by the Outpost campers at whatever outdoor locales they choose for camp and kitchen. So while the going may be rough, the chance to enjoy a hearty, satisfying meal overlooking an open fire and an incredible vista always has a way of making up for it.